Casseroles for a Cause: Third Time’s a Charm! Last February we held our second Casseroles for a Cause and was met with an even bigger outpouring of responses! Together we collected over 2,000 meals for our friends at Shepherds Table, Interfaith Works – Carroll House Men’s Shelter, The Arc Montgomery County, and Difference Makers. What’s even more exciting is that our partner organizations have requested more casseroles! The need is even greater this year as typical donation resources are being shared with other timely issues facing our community. By filling the freezers now in October, organizations will be better situated to prepare and plan for the upcoming holiday and winter season. Love to Cook? Love to Volunteer? Do Both from Home! October 21st – 28th Silver Spring Cares is partnering with Shepherds Table, Interfaith Works – Carroll House Men’s Shelter, The Arc Montgomery County, and Difference Makers to help fill freezers with delicious meals that will feed hundreds of folks in our community. We need your help to stay home and cook! Then we’ll even come by to pick up and deliver your casserole! 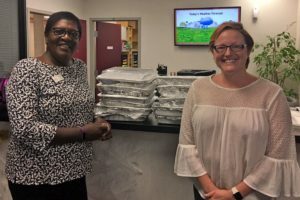 Pictured are Kitty Salahuddin, Director of The Arc Montgomery County Residential Services, and Heather Foley, Executive Director of Silver Spring Cares. Did you know that one easy way to support local organizations and families is by preparing casseroles? Volunteering to make a casserole or two helps to keep the freezers full for many of our most vulnerable neighbors. Your effort saves organizations and volunteers time, money and helps to eliminate any immediate food insecurity issues they may be experiencing. And you don’t even have to leave the house! It’s easy and fun to participate in Casseroles for a Cause but space is limited! You will receive an email with easy instructions, tips on how to host a successful night and even suggested recipes. Whether you make it a social gathering or you cook by yourself, you are helping to provide a warm and delicious meal for our community’s most vulnerable. In the week following, simply arrange a time for us to stop by to pick up your casserole. We’ll take care of delivery for you. For more information, email Heather@SilverSpringCares.org. Thanks for helping to make Silver Spring such an awesome place to thrive! Want to give a little all year long? Join Little Drops: Silver Spring Cares. Every month through Facebook we create a fundraiser for a local Silver Spring charity. By joining, you commit to donating $5 each month to the chosen charity. Together we make a BIG difference. This year we have raised $5,485 for nonprofits in our community! Silver Spring Cares works to strengthen the Silver Spring community through the power of connection. Whether you are looking to donate items, donate funds, or donate time, Silver Spring Cares is your destination for information on our community’s needs and opportunities for service. By engaging the diverse needs and resources of our residents, we can create a community in which all of us may thrive. Won’t you join us!